In Summer of 2016 we teamed up with Wildlife.la, Saatchi and Saatchi, and Toyota to create a magical bicoastal drawing experience for the public. Toyota’s campaign “Lets Join Hands” was about connecting people in the most essential way. Our role in the project begin with the exploration of the drawing experience. We wanted something that looked clean and helped the participants put together an image that was compelling and fun regardless of their drawing ability, but also re-enforced the concepts of coming together and teamwork. We drew on the flocking of birds as a metaphor for how members of a team come together in their movement to make something beautiful. With the core drawing experience established we moved on to explorations about how we might link the two users’ drawings, as well as methods of clearing the user’s drawing surfaces in a creative way. Kidpix was an inspiration here, the erase sequences were short and fun. We tried repeating the shapes’ movement, randomized movement via perlin noise, and eventually flocking of the drawing shapes during the clear process. Lightbright Drawing Animation from amanamun on Vimeo. With no viable external solution, we discerned novel methods of linking the two user’s drawing surfaces and video feeds in realtime. ( By sending video differencing packets and drawing control messages via OSC over TCP sockets within a VPN ). Shared Drawing POC from amanamun on Vimeo. We modeled the initial connection experience after Skype and Google Hangout, trying, wherever we could, to tap into UX which the participants might already be familiar with. The client selected a number of drawing prompts to help guide the user interaction, playing with the experience of drawing on the other user to make the game more interpersonal. Along with developer-collaborator Ulysses Popple, OA was able to implement a custom interface for the large vertical touchscreen hosting the engagement, as well as a corresponding sound design to help round out the experience and make it feel more immersive. We worked with Wildlife to render the drawings and video feeds out to files which were then assembled on a server and posted to Twitter . Big tents were put up to host the experience. One in New York ( Herald Square ) and one in Los Angeles ( Hollywood and Highland ), and pedestrians and social influencers stopped by to play the drawing game with someone on the other side of the country. In partnership with Twitter, a custom hashtag emoji was developed. Toyota committed to donate $20 for each tweet using it to the United Way. 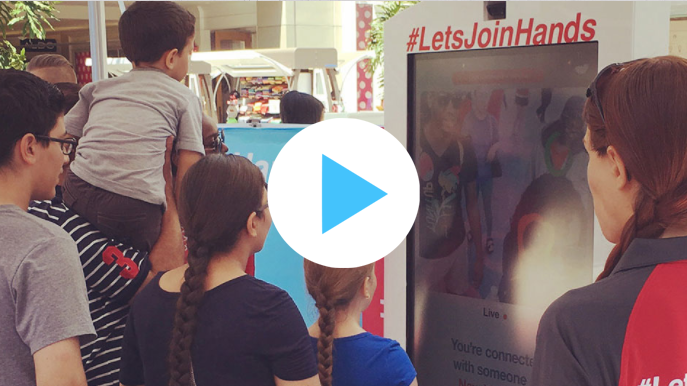 The content and excitement generated by the engagement helped Toyota reach their $250,000 donation goal, and lasting videos of project live on in the world of Twitter to remind us of all the good things that can happen when we just #JoinHands.